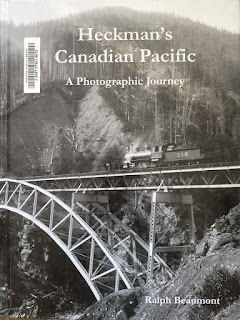 This is a review of the book "Heckman's Canadian Pacific: A Photographic Journey" by Ralph Beaumont. If you like Canadian trains, and especially the CPR, you'll want this book! Joseph Heckman was an engineer turned photographer who worked for Canadian Pacific Railway around the turn of the century (between 1898 and 1915), well before the more famous CPR photographer Nicholas Morant. Heckman took several thousand black and white photos for engineering purposes, and this has turned out to be a treasure trove of images of the early CPR. These images were collected - presumably by Heckman - into a series of books. The images show bridges, culverts, stations and other engineering works. One of the defining features of Heckman's photos is that they usually include people posing in them, such as a station agent and his family, or railway maintenance personnel. Heckman usually traveled by motorcar or handcar and his vehicle is also often in the photo. 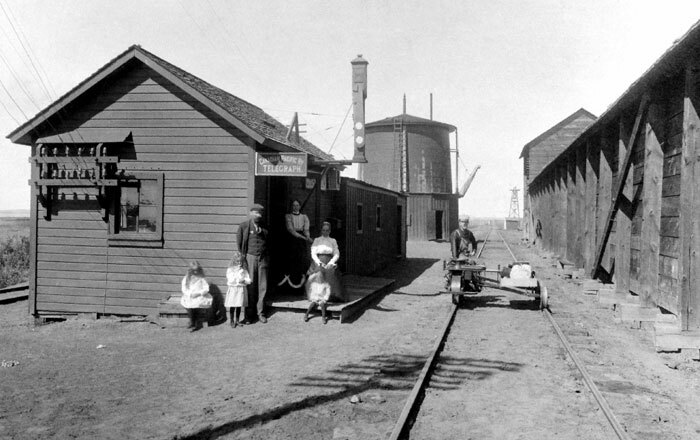 Here's a typical image, showing his handcar with crewman, plus the station agent and his family. This is Chaplin, Saskatchewan, July 13, 1890. Heckman kept extensive field notes, and the author used those to help identify the locations and other context around the photos. Author Ralph Beaumont has winnowed these images down to several hundred excellent images, and he has provided an extensive caption for each photo to provide context. Beaumont also describes each book of photos. It appears that not much was known about Heckman, but Beaumont has done some extensive research to discover details about the man and his life. This is a remarkable book about a remarkable collection, taken by a remarkable man. My thanks go out to Ralph Beaumont for the tremendous amount of work that obviously went into making this book.